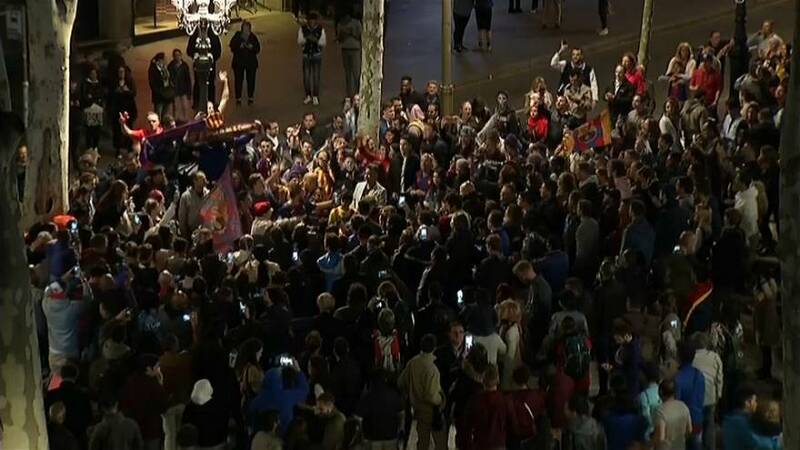 Barcelona fans have gathered to celebrate their team's 25th La Liga title after winning 4-2 at Deportivo La Coruna. Scores of them crowded onto Las Ramblas, in the heart of the Spansh- Catalan city, to celebrate as is customary around the Canaletas fountain. "This league tastes so good, every time Barca wins a title is very good and we must celebrate it in a big way," said 31-year-old physiotherapist Marc Batalla. "This is a title with so many records broken. And we are very happy. We deserve this," said fan Antonia Romera. "Incredible, a fantastic double, we missed the Champions League but we can't win everything all the time," said 31-year-old administrator Santiago Castaneda.